Google really, really wants you to pre-order a pixel, or at least to be aware that it exists. If you head to the Google homepage, you very well may see a popup encouraging you to pre-order the Pixel. Forget for a minute that most variants of the Pixel are sold out—Google is getting as much attention as possible for this phone. The notification is popping up at the bottom of the screen on both mobile and desktop platforms (you can see the mobile version above). 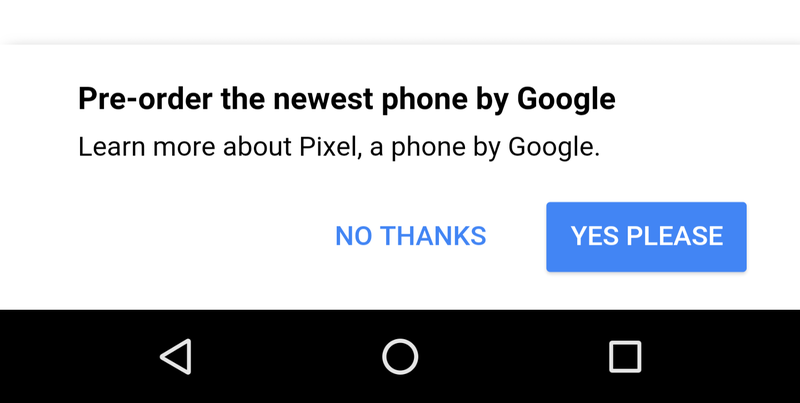 If you tap "Yes Please," you'll go right to the Made By Google site. From there, it's just one click to the Google Store where, again, the Pixel is mostly sold out. The ad doesn't appear all the time, but it's fairly widespread. This isn't the first time Google has advertised something on the homepage. Allo and Duo both got small text links, as have several past Android devices. However, the popup is much more prominent. They're really pulling out all the stops for the Pixel.